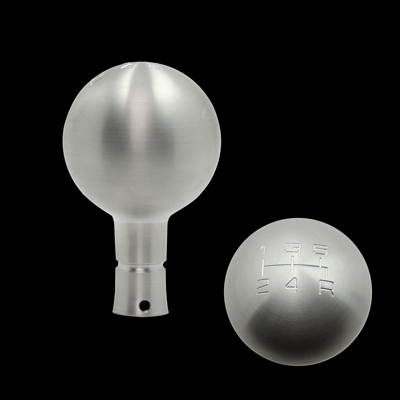 Innovative Bold Styling: Eliminate that Unsightly factory shift knob and move up to our Ultimate Anniversary II Style Billet Shifter Knob. Just like the factory Bullitt, Mach 1, 35th and 40th Anniversary Shift Knobs but now includes a custom 5 Speed engraving and unique shift design. Quality Construction: Crafted to fit & function better than an OEM part. No one else can Stack up to the bold clean styling of our aftermarket Billet / Stainless Steel Dress Ups, Street / Strip / Racing Suspension and Performance Parts for your American Muscle Car! All our Custom Billet Shifter Knobs come with all hardware required for a clean easy install in under five minutes for a Bold new look. Click Here for Instructions Fits these Vehicles: 1979 1980 1981 1982 1983 1984 1985 1986 1987 1988 1989 1990 1991 1992 1993 1994 1995 1996 1997 1998 1999 2000 2001 2002 2003 2004 LX GT GTS Mustang Cobra Shelby Roush Saleen & Steeda Vehicles. Made in the USA!